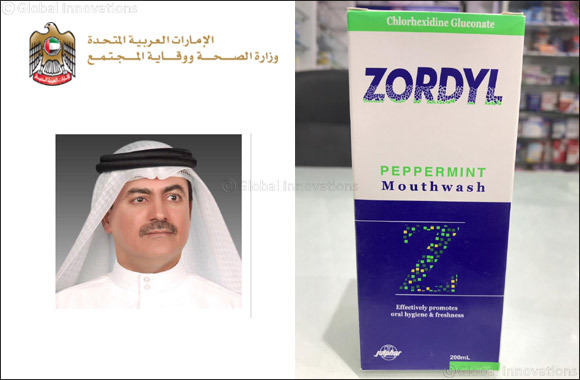 Dubai, UAE, January 26, 2019: The Ministry of Health and Prevention has issued a circular to the directors of medical districts, government and private hospitals, doctors, pharmacists and assistant pharmacists to withdraw Zordyl Mouthwash, which is manufactured by Gulf Pharmaceutical Industries (Julphar), due to the harmful impurities it contains. The Ministry revealed that the decision to withdraw the product came after it reviewed the reports received from Saudi Arabia, which stated that the Saudi Food and Drug Authority (SFDA) withdrew this product from the market. The reports also stated that the product was withdrawn after testing confirmed that it contained impurities that are both harmful and contaminated with bacteria, which made it incompatible with the manufacturer's specifications. HE Dr. Amin Hussein Al Amiri, Assistant Under-Secretary for Public Health Policy and Licensing Sector, stated that the Ministry will not overlook any abuses that may threaten human health and safety in the UAE. He stressed that the Ministry will not hesitate to do its part to withdraw any harmful pharmaceutical and medical products, regardless of the manufacturer. Dr. Al Amiri clarified that the circular called on the supplier to withdraw the above-mentioned product from the public and private health sectors, and it requested all health care practitioners not to use the product if they have it. The circular also requested that all pharmacies stop dispensing the product and return it to the supplier. Individuals suffering from any drug related side effects caused by using this product can get in touch with the Ministry by e-mail: pv@moh.gov.ae, or through the electronic reporting system available at the Ministry’s website, or by using the smart application UAE RADR. The circulars issued by the Ministry can also be viewed on the Ministry's website. Dr. Al Amiri remarked that the Ministry keeps up with the latest global developments in the world of medicine, and that it continuously seeks information on the latest circulars to withdraw medicine both regionally and globally. He added that if any warning is issued regarding any drug, the Ministry immediately takes action and issues a circular to all concerned health authorities to remove these products and destroy them, ensuring the health and safety of the community. Dr. Al Amiri appealed to the members of the community to remain cautious when dealing with medical products and to stop using any product that has a circular issued to withdraw it. He pointed out that the Ministry regularly inspects the products of local and international pharmaceutical companies and is in regular contact with these companies in order to address any issues. He also praised these companies and factories for their quick response and for their cooperation with the Ministry.